The Wave Waikiki will close this summer to make way for a planned condominium. 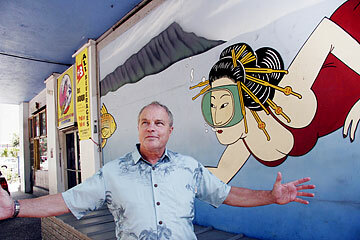 Wave Waikiki owner Jack Law stood yesterday in front of a mural at the landmark club. The Wave Waikiki, an entertainment landmark on Kalakaua Avenue for more than 25 years, will close by the end of June -- possibly earlier -- Jack Law, the nightclub's owner and founder, said yesterday. Law said the new owners of the property want the space vacated by June 7, but he's asked for an extension of a couple of weeks. "We have some things in the pipeline, entertainment that has been paid for already that we would like to present ... and then have a couple of weeks to clear the place out, have a sale to sell what has to be sold. "I just hope that the new buyers ... understand what an icon the Wave Waikiki is. In November (2006) it would be 26 years old. I hope we'll have the chance to give the old girl a send-off before we close the doors for good." The club has been operating month to month since the final months of 2003. The property was sold last July to Paul Thoryk, a San Diego architect who plans a condominium complex for the site. The Wave is Honolulu's oldest free-standing nightclub operating under original ownership at its original location. Anna Bannana's, which opened on South Beretania Street in the late 1960s, has changed ownership at least once. Hula's Bar & Lei Stand, which Law and Eaton "Bob" Magoon opened on the corner of Kalaimoku Street and Kuhio Avenue in 1974, was forced to move when the area was taken over by the Honu Group in 1998. Hula's survived the transformation from the open-air tropical nightclub that Law describes as "the tree Hula's" to a more conventional club he calls "the view Hula's" because of the clear shot of Diamond Head available from the second floor of the Waikiki Grand Hotel. But he says there is no place in or out of Waikiki where he could reassemble the Wave. "The legacy of the Wave Waikiki is the legacy of the Wave in that location," Law said. "Economics rules, and to find a property that is at least this much square footage is totally uneconomical." Law was indicted last year on charges of second-degree sexual assault involving a 30-year-old man, but said the charges had nothing to do with his decision not to find a new home for the club. Law hopes to move some of the Wave staff to Hula's, but says at least 20 of the current roster of around 30 will be left without jobs. "I have employees that have worked here since the 1980s -- one has been here almost since we opened in 1980 -- and there were times during the lean times that I worked to keep the place open for the employees." The club opened in November 1980 in a building had previously housed a series of nightclubs, including the Dragon Lady, the Royal Lei, Fast Eddie's and the Lava Lava. It strengthened its clientele when a fire temporarily closed Hula's and patrons shifted to the Wave. By the time Hula's reopened, the Wave was on the way to becoming Honolulu's trend-setting "post-modern" club "on the edge of Waikiki." Law worked with concert promoters Greg Mundy and Ken Rosene to position the Wave as a concert venue. Acts that included George Thorogood & The Destroyers, Bow Wow Wow, the Boomtown Rats, Grace Jones, Elvin Bishop, Fleetwood Zoo (with special guest Stevie Nicks) and Romeo Void. Later attractions included Poi Dog Pondering, Fredabla, Richard Cheese & Lounge Against The Machine and Powerman 5000. Law also presented Japanese pop and rock acts and stand-up comics -- most recently Jo Koy this month. The Wave also nurtured local alternative and pop-rock acts starting with the Squids, Sonya & The Revolucion and Hat Makes The Man, and continuing through present-day attractions Missing Dave, Pimpbot and The Crud. The club became famous for its elaborate Halloween and New Year's Eve parties, and for regular changes in decor, as often as four times a year. "I once thought that part of the entertainment of the Wave was (on) the walls, and to keep the place fresh and fun was to walk in and see something new. We've had a lot of wonderful installs -- and our Halloween and New Year's parties are still legendary." The Ewa wall of the building was decorated for more than a decade with the image of a cresting wave -- a reproduction of a famed Japanese woodblock print. But Law was forced to paint it over in 1991 after the Outdoor Circle convinced city officials that the mural was a "sign" rather than a work of art. Law took the issue to the Hawaii Supreme Court, but the threat of a $1,000-per-day fine forced him to drop the fight. He held a contest for a new mural instead; the winning design consisted of a group of palm trees that spell out W-A-V-E.
Law used similar ingenuity -- changes in format, promotions, advertising strategies and pricing -- to keep the Wave alive through business losses suffered when the drinking age was raised to 21. But time has run out. The Wave once anchored a vibrant constellation of nightclubs that included Cilly's, Masquerade, the original Pink Cadilac, the Stuffed Tomato (aka the Tomato and Waikiki Junction) and Casablanca (also called Marrakech). When the Wave is gone, the only survivor will be the current version of Pink Cadilac. Law says he has no reason -- business or personal -- for not fighting to keep the Wave open longer. "The writing has been in the stars for quite a while. I'm just grateful that I've been able to be in this location for as long as I have. Twenty-six years is a good run, whether you have a Broadway show or anything, (but) especially in the nightclub business."